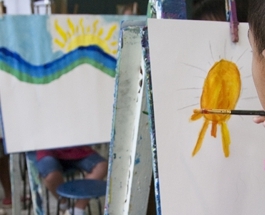 Education is the Honolulu Museum of Art's mission. 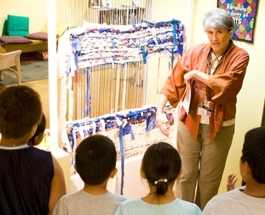 The museum works closely with teachers and schools to make art part of the lives of students. 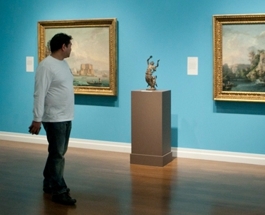 Our goal is to help you make the most of your visit to the Museum. We offer exciting school tours—many of them free—that support benchmarks in several subjects. Choose from Guided school tours and Self-guided school tours. In conjunction with the openings of our special exhibitions, the museum hosts free teacher workshops for all Hawai‘i educators. Workshops include a tour of the exhibition, lectures about the artwork, and an opportunity to share teacher resources and best practices. For information on future teacher workshops, contact teachers@honolulumuseum.org. Sign up for our quarterly Teacher e-Newsletter. In an effort to support arts education in the schools, we have started developing a suite of free resources for you to download and use in your classrooms. Our Elements of Art & Principles of Design resources will help you share these important concepts with students and tackle those Fine Arts standards. Feel free to download the pdfs to use as handouts or print a large poster to display in your classroom. Inspire creativity and encourage art vocabulary! Since 2014, Honolulu Museum of Art educators have collaborated with educators from the Department of Education and Hanahau‘oli School's Professional Development Center to create a series of visual art education posters that are distributed to every DOE school classroom on O‘ahu. The posters serve as an engaging path to the Hawai‘i Common Core Standards. The first poster, featuring Juliette May Fraser's painting Lei Sellers, came out in December 2014 and the final poster in the series was distributed in April 2016. Click each artwork title to see the poster. Watch students from Pōmaika‘i Elementary introduce visual literacy with Kolomona: Hawaiian Troubadour (the third poster produced by the Honolulu Museum of Art, the Hawaii Department of Education and the Professional Development Center at Hanahau‘oli School). Mahalo to Gina Smith, Creative Literacy Teacher and the media team at Pōmaika‘i Elementary. Have you been using the posters in your classroom? We would love to hear about your experience with them. Email your stories to teachers@honolulumuseum.org. Haven’t received your posters? Email teachers@honolulumuseum.org. Please specify which poster you would like (including a complete set), and include your name and mailing address. The Lending Collection is a free resource for island educators. Teachers can select objects from this trove of more than 13,000 tangible, portable examples of art and material culture from around the world. From Hawaiian poi pounders to Russian dolls, the collection offers thousands of ways to enhance teachers’ classroom experience. Located in the Honolulu Museum of Art School at 1111 Victoria St., between Young and Beretania streets. Learn more about the lending collection here.